Today was another phenomenal day on South Georgia. I am so worn out from our time here because it has been so much so fast. 6 days is a lot of time to spend in South Georgia, but it also isn’t enough. There is so much wildlife here, so many beautiful scenes, so much spectacular landscape, and enormous wild. For a photographer it is heaven. I can’t fathom anything coming close to this. 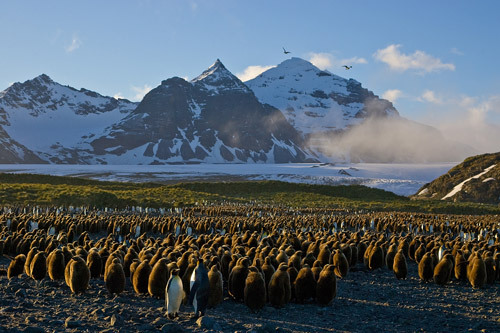 Salisbury Plain is one of the major King Penguin spots. It is hard to believe that I was actually getting tired of King Penguins. I was getting to a point where I was saying “not another King Penguin”, but it is easy to get jaded when you’ve seen hundreds of thousands of them. I can’t think of another animal I’ve seen so much of – not even the regular squirrel around Virginia. Despite becoming King Penguin jaded, I was ecstatic to visit Salisbury Plain. It is a spectacularly beautiful place surrounded by two large glaciers and a snow-covered mountain backdrop with dark pebbled beaches. Beyond the plain are little islands and icebergs – it is a painting. And there is no way ever that I will be sick of seeing King Penguins! After the monstrosity of life at Gold Harbor, and the constant watching for Elephant Seals, Salisbury Plain was a nice King Penguin “photography studio” to be at peace in. Gold Harbor actually served as practice for shooting the penguins, and I’m much happier with my penguin photos today than yesterday. I had to skip breakfast again to get on shore early and didn’t have a whole lot of time to rest before we were on another hike. This hike was not nearly as adventurous as the one at Cooper Bay (Cooper Bay’s was more of a climb than hike), but we finally got to see the Gray Headed Albatross. I’ve been dying to see one and I got to see a whole bunch! 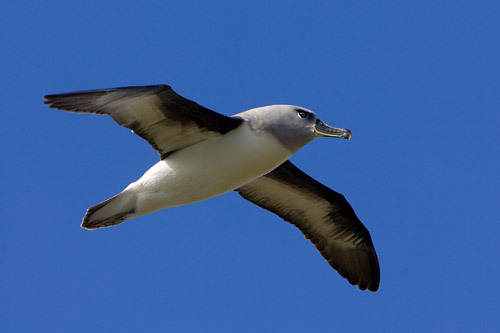 To make matters even better, we stumbled upon 8 nesting albatross unicorns: the Light-mantled Sooty Albatross. Yes, I know, we’ve been around the Sooty Albatross every day, but this is extremely uncommon. To get both Gray-Headed and Sooty nesting at the same spot was like winning the lottery. I snapped almost 700 photos in the hour we were there jumping between the two different types of birds. It was non-stop as they flew overhead, made their calls, performed their aerial ballets, or worked on their nests. Mind blowing for birders and photographers. 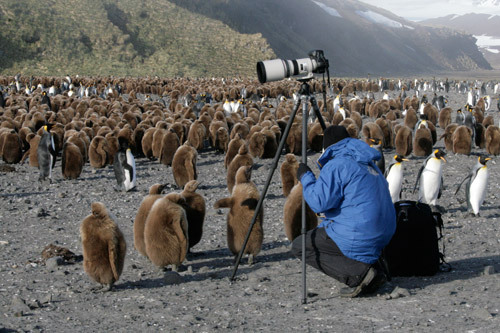 The whole show actually converted a landscape photographer into a wildlife photographer. Gray Headed Albatross - beautiful! Now we’re steaming for Stanley, the capital of the Falklands, and have two days at sea. Things are calm right now with seas in the 5-8 foot range, but we’ve been warned to enjoy these calms while we can. Tomorrow should bring a weather change. There are two “clicks” or groups on the ship: the photographers and the non-photographers. It isn’t apparent during meals or organized activities – we’re all having a good time together – but the photographers own the back of the lounge where all the power outlets are available for our laptops. We sit in the back closest to the big back deck so we can run outside to get the shot in a hurry, but when there isn’t something to shoot we’re discussing prior shots or Photoshop techniques. That probably sounds very boring to most of you reading this, but it has been extremely educational for me and my photography has definitely improved. I’m looking forward to two full days of relaxing photography seminar amongst the rolling Southern Ocean. Me having a very meaningful conversation with the Oakum Boys. "Are you my daddy?" & "Did you bring me food?" 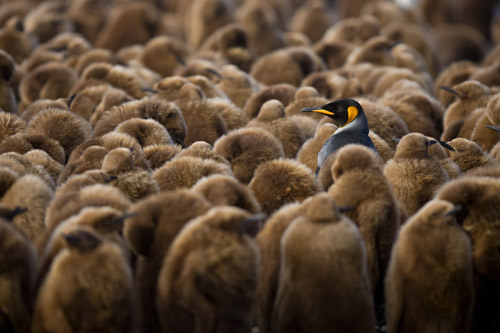 *Oakum Boys are King Penguin chicks. The sealers and whalers named them after the young boys who caulked the ships with tar and horsehair. The Oakum Boys (people) would be covered in sticky horsehair at the end of the day. When the first King Penguin chicks were seen they were believed to be another penguin species, but they’re just King babies covered in brown down feathering. The name stuck. The Oakum Boys are tons of fun. They are curious about everything and will walk right up to you. They peck at bags, shiny things, and tripods. While I was engrossed in shooting a particular scene some Oakum Boys ruined my shot as they snuck up on me and started pecking on my tripod legs. Like some people, they seem to have a gravitational pull toward Canon 300mm f2.8L IS lenses. When I was using the 300mm, they were on me like glue. When I was using the 70-200mm they only came over if they were bored. Remind me to tell you about the Oakum spazz – very funny. Still at a loss for words for these images and stories. Can’t wait to hear all about it over Mexican, and some Beer. Alex – your shots are just spectacular! Can I join you and Mark for Mexican and some beer? Alex, I continue to receive awe-inspiring updates of your travel…I absolutely love it. Thanks so much for sharing! Stay warm and post when you can. You’re not missing anything here. I think you should just make it a welcome home “Mexican and Beer” party – I don’t think two many people will pass it up. Jeff and I will come down from Baltimore! You and Kershner are the only two whose tweets I have set up to come to my phone…I am so disappointed when I get one from you and I am nowhere near a computer and know I have to wait to see the great pictures. Flip Nicklin will be in Baja shooting the whales with Lindblad and NG during the 2009 season. Want to learn about taking a better picture? Flip’s the man! Mom – I’d rather bring Zorro down here….just an excuse to get back to South Georgia. By the way, I will be making this trek again before I die. I think I want my ashes spread on this island. Erica – that’s cool to hear. You want Mexican and a Beer? C’mon! OMG…the Oakum boys are too adorable. I like your imaginary dialogue. I’m sure they’d love you to bring them food and tuck them under your coat for warmth.